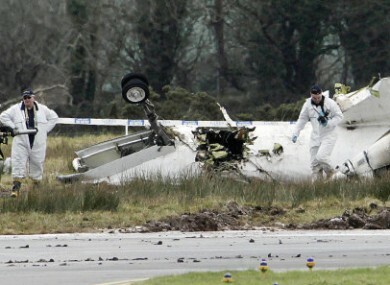 COMMUTER AIRLINE Manx2 has announced it will withdraw all services on its Belfast-Cork route from next month, in the wake of the air crash at Cork airport earlier this month in which six people were killed. In a statement released this evening, the airline said it had carried out an operational review of the route, on which the ill-fated flight had been travelling when it crashed on landing shortly before 10am on February 10. The company said it would continue to operate the flight for two weeks, until March 13, in order to minimise passenger disruption, but that all bookings for after that date would be fully refunded. The airline’s other routes would remain fully operational, however. Manx2 had launched the route on which flight MN7100 was travelling just last September, with flights beginning on September 8. The route had only been taken up by Manx2 after Aer Arann had withdrawn its services on the route last summer after it went into examinership. Manx2 had operated two daily flights in each direction along the route. Email “Manx2 to withdraw Belfast-Cork route next month”. Feedback on “Manx2 to withdraw Belfast-Cork route next month”.